A-HOTEL.com - Luxury and cheap accommodation in Seoul, South Korea. Prices and hotel, apartment booking in Seoul and surrounding. This indicative offer was derived from the most recently booked accommodation in Seoul and sort by the price, from cheapest Seoul accommodation to the most expensive hotels. To select accommodation by your preferences we recommend to choose from 1 759 accommodation offers in Seoul in total. By entering the dates of your overnight stay in Seoul and using the filter tools you can sort the best possible accommodation for you. The entered dates of your stay are crucial for the most accurate offer as it derives all the online information on pricing and availability of Seoul accommodation. Then you can book the selected Seoul lodging (hotels, apartments etc.) immediately. Just a 4-minute walk from Exit 12 of Dongdaemun History & Culture Park Station, Novotel Ambassador Seoul Dongdaemun Hotels & Residences in Seoul features 5-star accommodation with a fitness centre and a bar. Conveniently set in the Jung-Gu district, this hotel is located a 4-minute walk from Pyounghwa Market. 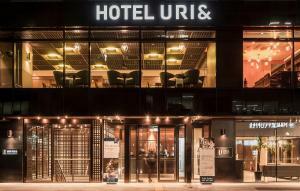 Linked to Euljiro 1-ga Subway Station (Line 2) and Lotte Department Store, this luxury hotel provides 10 food and beverage options and rooms with an LCD TV. Guests can also make use of the fitness centre and spa. Grand opening from September 2018, Lotte Hotel The Executive Tower features accommodation with city views. Complimentary high-speed wired and wireless internet are available. Located only a 3-minute walk away from Seolleung Subway Station (Line 2 and Bundang Line), L7 Gangnam features a fitness centre, conference rooms and a restaurant. Free WiFi access is available for guests to use. Situated in the Mapo-Gu district in Seoul, L7 Hongdae offers 4-star rooms with free WiFi. Among the various facilities of this property are a fitness centre and a bar. Set in Seoul, 1.7 km from Ewha Womans University, Hostel Gaon Sinchon features air-conditioned rooms with free WiFi. 1.2 km from Bongeunsa Temple, HOTEL in 9 Coex Center Gangnam is set in Seoul and provides air-conditioned rooms with free WiFi. Conveniently located a few minutes’ walk from Exit 9 of Myeongdong Subway Station, L7 Myeongdong boasts a restaurant and modern air-conditioned rooms with free WiFi access. The smoke-free rooms have a satellite TV, fridge and an en suite bathroom equipped with free toiletries, slippers and a hairdryer. Located between floors 76 and 101 of Lotte World Tower, Signiel Seoul boasts panoramic views of Seoul in all 235 rooms. This five-star hotel features a champagne bar, Michelin-starred restaurant, indoor swimming pool, fitness centre and banquet facilities. Modern Korean design is featured in Hotel Aventree Jongno, just 5 minutes' walk from Insadong cultural street. It is conveniently located within 10 minutes' walk from Jonggak (Line 1), Anguk (Line 3) and Jongno 3-ga (Line 5) subway stations. Offering an in-house fitness centre and a café, Lotte City Hotel Myeongdong is situated a 3-minute walk from Exit 1 of Euljiro3-ga Subway Station (Line 2 and 3). Free WiFi and free private parking is available. GLAD Gangnam COEX Center is located next to Exit 1 of Samseong Subway Station (Line 2) and houses a fitness centre, lounge and front desk open around the clock. All rooms here come with a seating area with a coffee table, a fridge and an electric kettle. Located right next to Namdaemun Square, Fraser Place Namdaemun provides easy access to Seoul’s popular attractions. WiFi is available for free throughout the property. Conveniently located in Jung-Gu district, Ramada Hotel offers spacious rooms with luxurious bathrooms. It has a restaurant and is only a 15-minute walk from the popular Myeongdong Shopping Street and Namdaemun Market. Just steps from Gwanghwamun Plaza, Four Seasons Hotel Seoul boasts commanding city views and features 4 in-house dining, a state-of-the art fitness facilities and traditional Korean saunas. The royal Gyeongbokgung Palace, Sejong Art Center, Cheonggyecheon Stream and the city hall are all within a 10-minute walk from the luxurious 5-star hotel. Located in Gangnam, Hotel Uri& offers an on-site fitness centre and dining options. The hotel is 550 metres from Samseong Subway Station (Line 2) and 250 metres from Korea City Air Terminal. Boasting a bar, Hotel NewV is set in Seoul, 1.2 km from Seven Luck Casino Seoul Gangnam Branch. Designed with a cinematic theme, Hotel28 Myeongdong is Korea's first hotel to be a member of Small Luxury Hotels of the World Ltd. This boutique hotel is located in the centre of Myeongdong, a popular shopping area. Newly renovated in 2017, Pacific Hotel is less than a 5-minute walk to Namdaemun Market and a 5-minute drive from N Seoul Tower, an observation tower located on Namsan Mountain. Featuring free WiFi, the modern rooms come with a heating system, air conditioning, flat-screen TV and minibar.